Has Your Loved One Suffered a Head Injury Because of Nursing Home Neglect? When it comes to traumatic brain injuries, the Centers for Disease Control and Prevention (CDC) reports that adults age 65 and older have the highest rates of hospitalization and death. 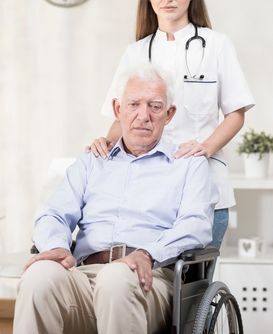 Falls are a leading cause of these injuries, which makes them a serious concern for people residing in nursing home and assisted living facilities. Removing tripping hazards, such as rugs, tables, and cords, from commonly used paths in residents’ rooms. Keeping the hallways and walkways free of clutter. Installing handrails and non-slip mats in all bathtubs and showers. Installing grab bars next to all toilets and on both sides of stairways. Using chairs with padded armrests. Installing proper lighting throughout the senior’s home or apartment. Make sure that residents are regularly attended to so that they do not attempt to get out of bed without assistance if that is beyond their physical abilities. Be aware of medications that residents are taking. Some medications may make residents light-headed, confused, or off-balance. Remain calm in stressful situations, and never physically assault a resident. When nursing home staff fail to exercise reasonable care and instead are neglectful or abusive, serious falls and head injuries can result. Changes in tasting or smelling abilities. Irritability or changes in mood. Changes in speech, fine motor, gross motor, or cognitive skills. These changes may be a sign that a resident has suffered a TBI. However, only a qualified physician can make that determination. Complications in the elderly can lead to a long recovery period, or they may even result in permanent disabilities such as paralysis or coma. Death can also result from these injuries. Sleep, rest and relax. The brain needs time to repair itself. Go slowly. When your relative is cleared for normal activities, insist that he ease back into his daily schedule gradually. Get medical help. A doctor should examine him, diagnose him, and come up with a treatment plan. Watch medications. Make sure your relative is only taking doctor-approved medications while he recovers, and make sure his doctor knows that he suffered a brain injury.